You’ll want to coat your tongue with fire suppressant material before drinking, because once you start, the Uitvlugt 16 year old grows fangs and attacks your face like a junked-out xenomorph. Curiosity. That’s what got me here: simple curiosity. I’ve never tried anything by Old Man Spirits, but man, I thought, how can you even begin to argue with that cool distillery, and the strapping libido of 62.9%, which is powerful enough to make Cadenhead and A.D.Rattray take a respectful step backwards and cross their knees. And I loved the Spartan, zen-like simplicity of the bottle, which resembled nothing so much as a production prototype before some marketing genius started tartin’ her up. So yeah, when I was contemplating my purchasing decision, I took a flyer. What the hell, right? It’s not like you get a chance to check out tasting notes on a relative newcomer every time to see if there’s value for money here. Old Man Spirits is a craft maker based in the north of Germany, around Schleswig, and is a new entrant to the field, I think. They have a Panama rum, a Guyanese rum (this one), one from Belize, a Caribbean blend (including a spiced version), and a gin. There will be others. Their website is still very much a work in progress because while it has good notes on the products’ profiles (plus some plugs for how good they are), none at all on the sourcing or making of these products, or the company’s stated philosophy. Getting back to the review: as noted, extremely simple presentation; wood tipped cork, nice; hay-honey coloured spirit, bottled at cask strength. All good. It was medium bodied, even light in the glass, and I loved that yellow colour. 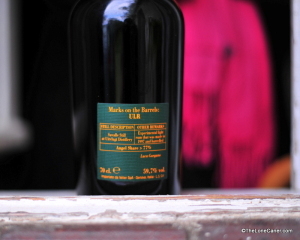 The aromas on the nose were intense, of course – couldn’t get away from that, not at 62.9%. Bread and butter, salt crackers whiffed over with white pepper and a very spicy burn started things off. 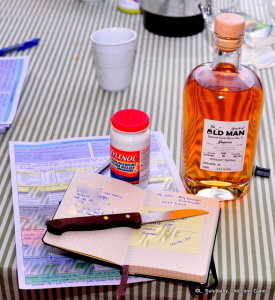 The rum was quite raw, even searing – as unexpectedly severe as my schoolmaster’s ruler (“Pay attention Mr. Caner!” whap!). I’ve had my share of cask-strength monsters that had been in oak barrels for many many years, but this one definitely left a few shavings from the bark in there. Some softer notes tremulously crept out after ten minutes or so: faint white flowers, powdered sugar, unsweetened dark chocolate, not enough to make a real difference. On the rather dry palate, a little sweetness began to be noticeable, and little of the salt cracker aroma carried forward, thank heaven; yet the burning lack of couth persisted – vanillas, tannins, florals, all the stuff I’d expect from an Uitvlugt distillate, were so muted as to be virtually absent. Even adding some distilled water didn’t save it. And man, was it ever fierce. Holding on to this rum was like grasping a live grenade. The finish, long as it was, exhausted me. It was all heat and spice burn and little in the way of closing scents (very faint chocolate and vanilla). By the time I was done sampling, I was left feeling dissatisfied, a shade undernourished and perhaps even underwhelmed: I’d been on a so-so ride with something, just not one that added up to much of anything. While it may have been unfair to compare this to Velier’s Uitvlugt 17 year old from last week, I did have them both at the same time and the comparison was inevitable…to the detriment of OMS, I’m afraid. 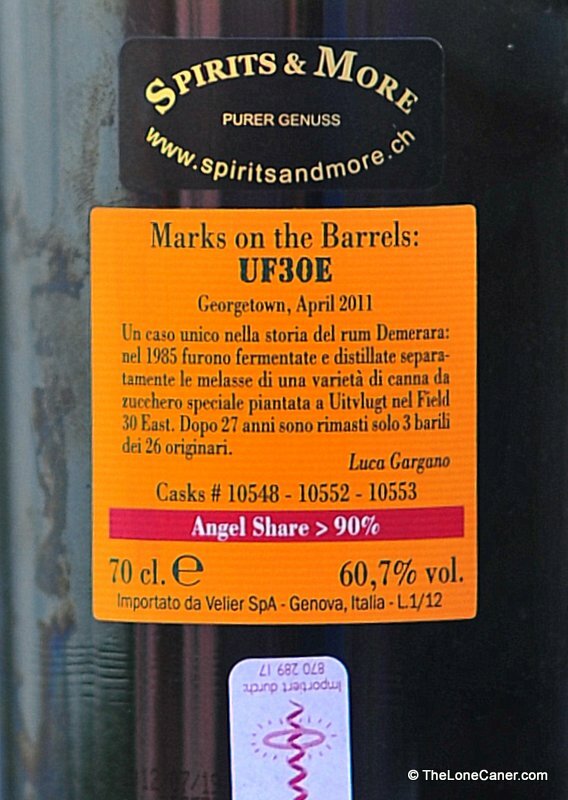 OMS was strong and from a source distillery I like a lot – hell, from a country whose spirits I like a lot. Yet, for a product this expensive (€90 via Rum&Co) that wasn’t enough…I wanted and expected more. It therefore only gets points for intensity and some interesting moments on the palate, and in my earlier days, gotta be honest folks, it would not have cracked 70. Producing a quality, aged, cask-strength feral feline requires more than merely a draw-off from an old barrel somewhere – in order to make the product create vibes, generate word of mouth and really sell, attention has to be paid in ensuring that the thing tastes like more than just fuel for an Abrams tank, and this is something Old Man Spirits could perhaps take note of. After drinking this full-proof rum, I felt like the lady from Riga. 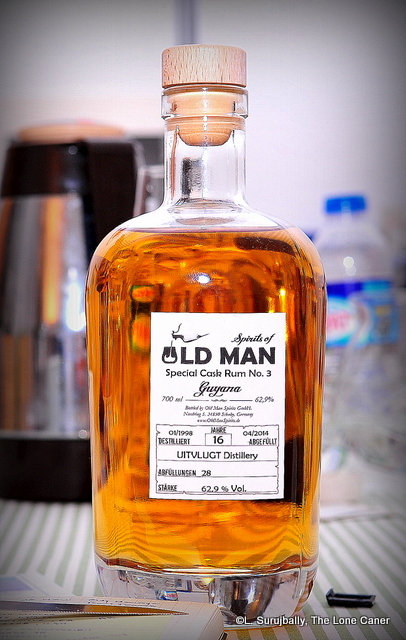 Old Man Spirits Special Cask No. 3 62.9% has done its best to tame the raging tiger trapped in the bottle, but somewhere along the line, it faltered, and now I know what it feels like when the tiger gets loose and bites back. A point of note was this particular bottle was an out-turn from one barrel, and it yielded 28 (yes, 28) bottles – it was this, among other things, that led me to drop them an as-yet-unanswered email for additional information. Because when you think about it, it’s unclear how a splash can be made in the market with something this limited – it would have to walk on water in an extraordinarily competitive sea to accomplish that, and that’s without considering the marketing outlay and samples that have to go all over the map to rustle up some excitement. My take – until they get around to responding to me – is they’re doing this on an exceedingly small and limited scale…sort of a single spy to sound out the market, if you will. Expect profit to be elusive. 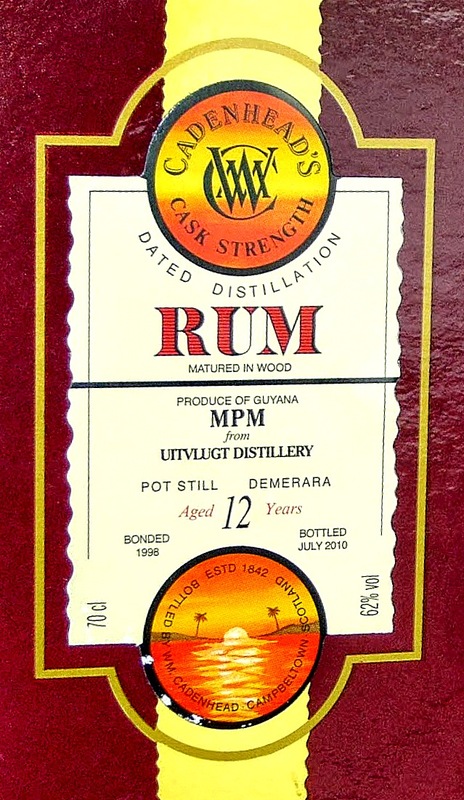 Also: why are two Uitvlugt rums which are so close in age, and so similar in proof, so different? Why is one demonstrably better, smoother, tastier? I can only hazard that — if we assume a similar distillate and a similar fermentation process — that it comes down to the barrels. Somehow, possibly, OMS got dinged with, or utilized, older, already much-used, almost-dead casks which had little but moral support to impart to a rum which needed a much firmer dose of authority. It’s also possible that the single barrel from which the 28 bottles were made was not aged in the tropics, as Velier is adamant theirs are. Or it could be that the agent/taster/buyer for OMS actually liked it this way, preferred something more savage, and it was issued as it was because of that personal opinion (which is reasonable – can’t expect everyone to like what I do). Velier is equally clear it doesn’t add anything to its products, and while OMS makes no such statement, I don’t think the profile suggests additives (rather, the reverse). All of this aside, it will be intriguing to see how other and future products of OMS shape up, because one product does not sink a brand (or define it), and for sure I’m not done buying their stuff just yet, if they continue to make it. Unfortunately, the next pass is a year down the road so it’ll be a while before I’m back to the company’s wares. I’d really like to see what they did with the Panama. There’s a tamed 46% variation on sale as well, but I didn’t buy it. From the write up, it appears to be a diluted version of this rum, not anything especially different. A castrated tiger, perhaps. Distilled January 1998, bottled April 2014. An exceedingly well-made, clean, relatively light rum with remarkable depth of flavour and beautiful mouthfeel. Velier, as its barrels mature in Guyana, issues annual releases when they feel they are ready, much as Rum Nation and other craft rum makers do. This presents a particular and peculiar problem to rummies, because there is no consistency to any of them: in other words, while a DDL El Dorado 21 Year Old will be more or less the same no matter when you buy it, a Velier PM 2013 release will not be the same as a Velier PM 2014 release, even if they are both fifteen years old. This, to my mind, highlights a great strength and great weakness of craft bottlers, because while it allows for amazing creativity and variety, it also limits the issuance of a particular bottling to a few thousand bottles at best, and it forces consumers to shell out a lot more money for favoured companies’ products – as I have. That aside, let’s start at the beginning with some core facts about the subject under review here. 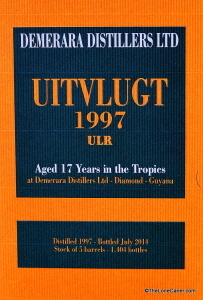 Velier issued this new (2014 year) release in July, with 1404 bottles deriving from five barrels; it was distilled on a Savalle still, it’s an experimental version – a lighter distillate from a still which can produce both light and dark variations, hence the “ULR”, which stands for Uitvlugt Light Rum (thanks, Cyril). The labelling on bottle and cardboard case is excellent, by the way: no fancy frippery or outlandish graphics, just pertinent facts about the rum (including evaporation losses of 77%), as brief and stark as a haiku. Just about everything you might want to know is there. Nose? Wow. Just lovely. 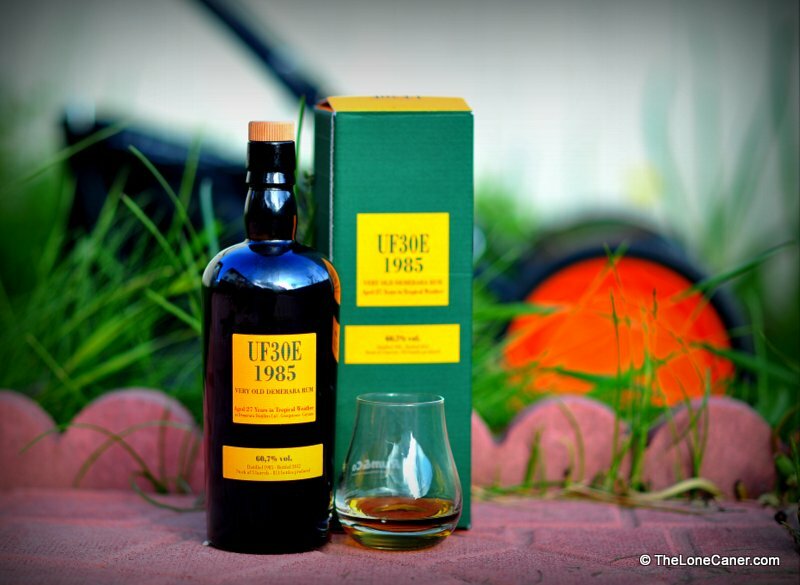 The ULR 1997 was a darkish-honey colour in the glass, and emitted heated vapours of soft clarity that was reminiscent (if not quite as spectacular) as the that McLaren that was the UF30E. Vanilla, herbal tea and white flowers right off the bat, not fierce on the attack, just clean and strong, and persistent to a fault. Vague caramel and salt biscuits followed on, and easy notes of fruit jam and sweet, ripe black grapes closed off the nose – it was so succulent that I felt I had just roped in Monica Bellucci in a teddy. You can tell a masterful rum when, as you sip the thing down, 59.7% doesn’t really feel like it. It was as exciting and well made as a Gibson guitar, with notes that hummed and vibrated in harmony…I honestly don’t know how this is accomplished so well. The white chocolate, cafe-au-lait, pastries, and creamy buttery notes slid smoothly past my taste buds and there were some oak tones winding their way around the palate, though not enough to spoil the drink. Nougat and hazelnuts shimmered around the edges, moving to a lingering, warm finish with final fumes of raspberries in cream. Uitvlugt was a West Coast Demerara sugar plantation which Bookers McConnell mothballed decades ago: it means “outflow” in Old Dutch (yes, like New York, Guyana was once a Dutch colony), and it usually has marques of ICB/U, ICB/C and ICB associated with it (most notably by DDL itself), possibly by reference to the original owner of the plantation, Iohann Christoffer Boode; it’s unclear when this new moniker of ULR began. Its rums, made from a metal Savalle still, are usually characterized by a distillate which is not so heavy as the dark brooding machismo of, oh, Port Mourant. This one may be even more so. 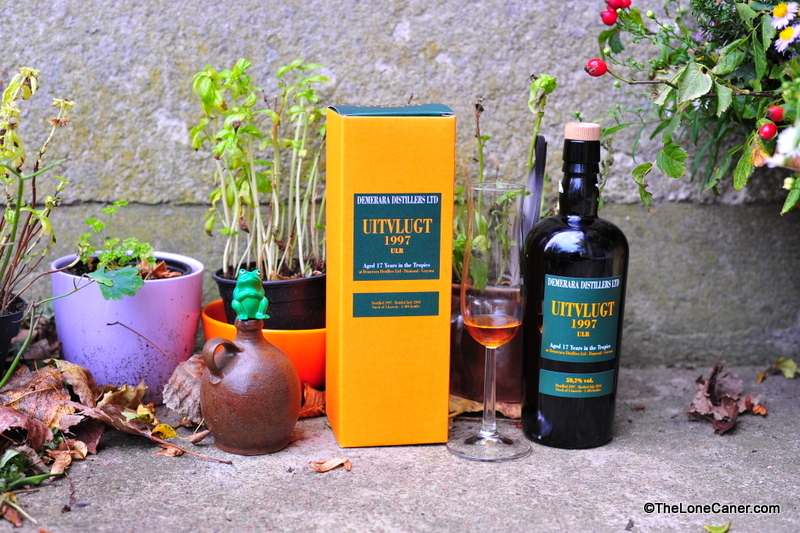 Summing up, the Uitvlugt 1997 is immensely enjoyable…I went through three tasting glasses of it in next to no time, it was so pleasant. It’s cleaner and lighter than other Veliers (like the Albion 1994), has perhaps more in common with the Blairmont 1991, and stands singularly apart from the remarkable Diamond 1999 (2014 edition); it’s a UF30E in waiting, maybe. It might not be the most charismatic or powerful exhibit in this sub-universe of the equine-endowed full-proofs, but it isn’t a shrinking violet in the greenhouse either, and compares exceedingly well with all its other siblings. NB: This was one of four samples provided by Luca Gargano to me personally when he heard I would be in Europe in October 2014. I stand by my sterling review because it really is that good (see the review for Old Man Spirits’s Uitvlugt 16 year old next week for an interesting counterpoint). I have outstanding query from my email to him…I’ll get into that when I deal with the Old Man. See you next time. Concentrated black cake. Uitvlught East Field #30 takes its place as the source of one of the best rums I’ve had this year. 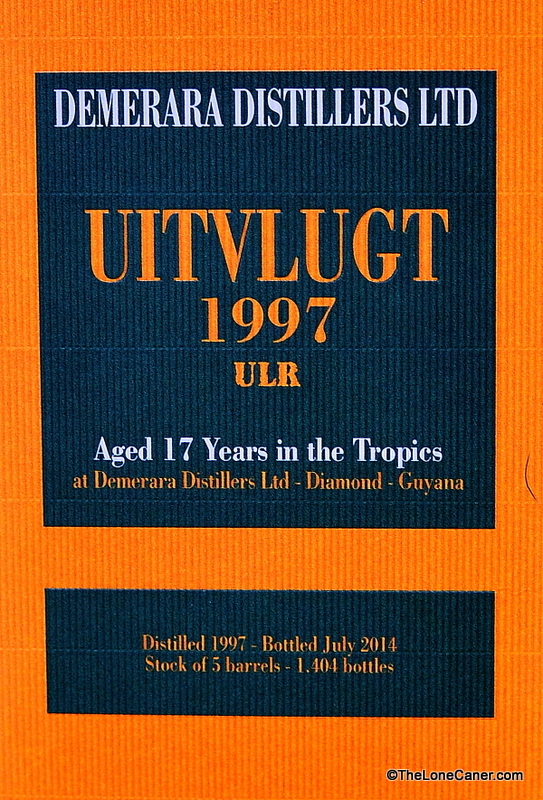 In my rather tiny world, sourcing a rum like the Uitvlugt 1985 27 year old 60.7% is quite an experience. A rum limited enough, rare enough and old enough that to use a single appellation like “aged” to describe it is akin to saying Tolstoy wrote rather long books. The series of rums made by Velier (these are not DDL products) answers every beef I ever had about rums not being strong enough, addresses every complaint about a lack of imagination. Thus far, each of the full proof series has been spectacular, powerful, brilliant, exceptional, original and charges out of the bottle like a bat out of hell to give me all it has. This is what rums were made to be. This is what more rums should be. Want to go up against the Scots, boys? Want to give whisky some hard card? You’d better start making more of these. Having established its pedigree as a rum massive as an oak tree flung by a F5 hurricane, what of it? It’s aged a magnificent 27 years in the tropics, losing 90% of its volume if Velier is to be believed, and powerful enough to brain a rampaging ox, but is it any good? Mmmm. Yeah. It’s good. Nosing this torqued up full proof is, like, I dunno, trying to lasso a drunken moose: I mean, the rum is hard charging to a fault, practically an inhalation of supercharged testosterone — a quick sniff and my abs were instantly firm enough to do my laundry on, and I was casting restive glances at my wife. Thick, spicy smorgasbord of fruit notes led off right away: prunes, currants, raisins, blackberries lead in, followed by faint flowery notes, licorice, cloves, black unsweetened chocolate. I felt I was at the dessert buffet of some high class hotel restaurant. Heated, yes; spicy, almost; but you know, for a beefed-up rum like this, once the alcohol fumes blow off, you can’t help but be impressed with a nose this rich, where so much is going on all at the same time. Dark mahogany and ruby red tints coloured the spirit itself, which was a treacly, almost heavy liquid in the mouth. Here was a spirit that coated your tongue, your tonsils and your teeth and hung on with the tenacity of a junkie to a five dollar bill. Awesomely smooth for its strength, generously providing tastes of licorice, chopped dried fruit for Caribbean Christmas black cake, green grapes just starting to go, aromatic port-finished cigarillos…it’s deeply, darkly luscious to a fault. I tasted some of the oak tannins imparted by the long ageing, and in no way were they disconcertingly acidic or too sharp, but just right, leading to a long aromatic, finish as lasting as a diva holding a high C….like, forever. If this was a real opera, somewhere, Pavarotti would be feeling inadequate. Even at 60.7%, which some might consider a bit much, the Uitvlught impressed with its mastery of blending art. Like its brothers (the Albion 1994 and the Diamond 1996), this rum is one of the tastiest, biggest, baddest, most fantabulistic spirits I’ve tried and that sound you heard was, quite simply, my mind being blown. 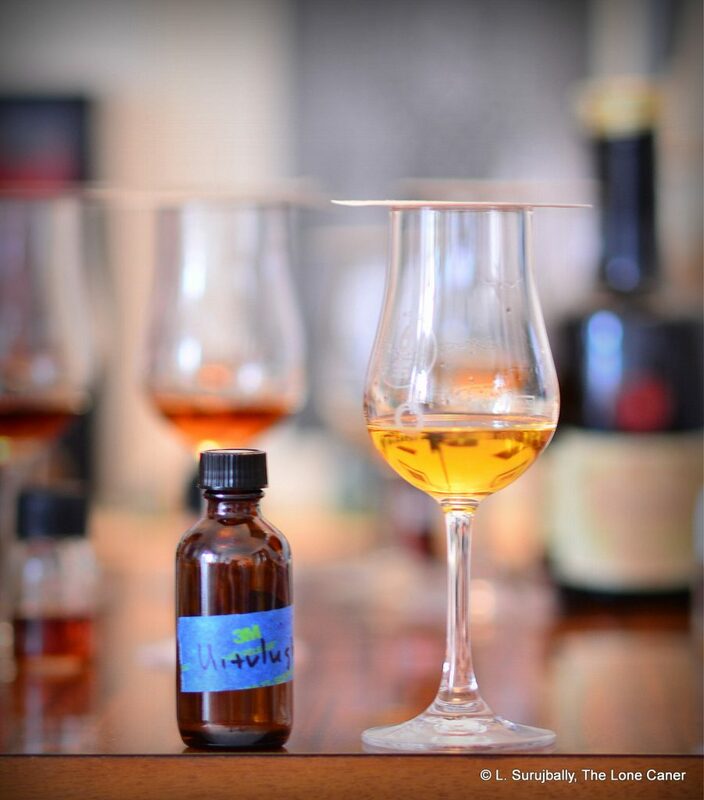 Because this intensity is precisely why we should attempt to move past 40% in our rums – the strength of flavour and body, the commingled multitudinous tastes, simply invites sampling and more sampling, and then even more, just so you could check out what that last smidgen of flavour really was. 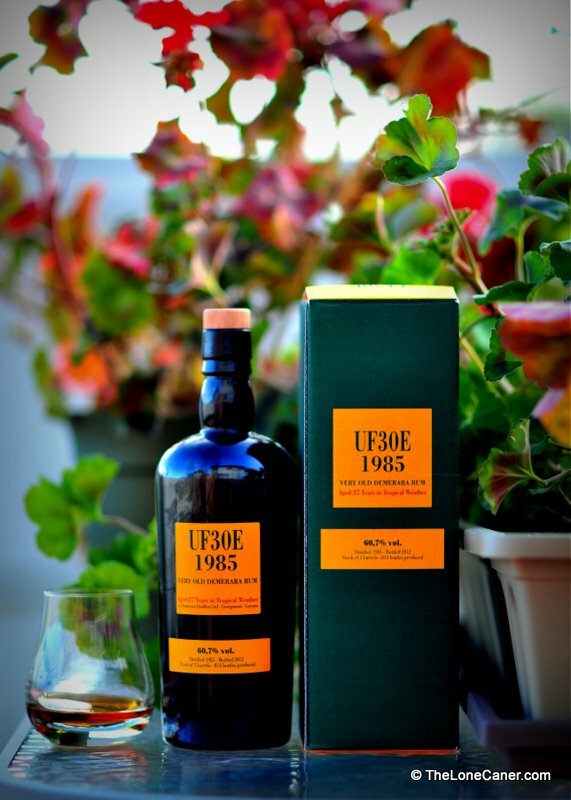 Velier out of Geneva bought three barrels from DDL (they are not DDL rums in spite of their labelling), aged them for twenty seven years and, in line with other European makers, simply bottled them as they came out. The Velier line is really kind of fantastic – marques from Blairmont, LBI, Port Morant, Albion, Skeldon, Enmore (and that’s just the Guyanese) are all available, if rarer than a compliment from my boss. I can’t begin to express my admiration for the series – there’s an unapologetic narcissism to them that doesn’t so much flip the bird at standard strength rums as ignore them altogether. Their rums are awesome – terrific nose, aggressive profile, epic finish. And, at end, it may be self-defeating – it may simply be too much to be contained in a mere bottle. To have this rum burbling in your glass is to know what Godzilla’s captor might have felt like. By the time all the tasting notes have been wrung out, it may actually be a shade too amazing for those who prefer something a little less strong (like 40%). But you know what? I don’t care. The full proof rums from Velier are what they are. Not everyone will like them — their starkness and somewhat elemental brutality will be off-putting to many — but then, they are not for everyone. Verlier echoed the European ethos of simplicity and minimalism in their products, wrestled the white lightning out of the cask and trapped it in a bottle for those of us who care. If you can find Velier’s rums, any of ‘em, my advice would be to buy them, and quickly. Because if you’re ever into rum for the long term, there will come a time (if it has not arrived already) where you’ll be so damned glad you did. I know I am. And now, after writing this review and taking a last sip, I think I’ll go see what the wife is up to….assuming she hasn’t already fled. Other notes that come to mind: you can ignore this section as it is not pertinent to the review. I’ve made no secret of my wistful disappointment of tame drinks that go exactly no place special and have a small sense of imagination. The question that arises, is why aren’t more iridescent gems like this one ever made? What’s keeping the rest of the world from following suit? Why aren’t Flor de Cana, DDL, Appleton, Mount Gay or others indulging some hi-test full proofs of their own, besides issuing the occasional 151? I suppose I can think of several reasons: they won’t sell; they’re seen as too exclusive; they’re tough to find; they don’t appeal to the young; they’re too strong; too expensive; too tough to make by labels content with what they are doing already; and market forces favour 40%. There are special editions around, of course — lots of them, almost all made in Europe. The challenge is finding any. Perhaps nothing shows the potential of such a niche market as the speed with which such specialized bottlings by Bruichladdich, Gordon & McPhail, Fassbind, Bristol Spirits, Berry Bros., Velier, Silver Seal and Cadenhead fly off the shelves. They may languish in shops in North America, but I chose to believe it’s because they are not commonly available, not well known, and therefore remain a perceived nouveaux riche kind of pastime for crazies like myself. So it’s not as if the full proof, limited-cask expressions don’t exist – they do. Here’s hoping the major bottlers in the West Indies and the Americas will follow suit and produce their own full-proof liquid machismo one day, the way Velier has done here, so magnificently.